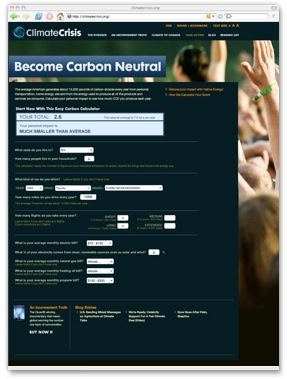 Challenge: Create the technical specifications to build a carbon footprint calculator for Participant Productions in time for the Sundance Film Festival release of the film An Inconvenient Truth. Results: Sunnywood worked directly with former vice president Al Gore and a small team put together by World Resources Institute. We provided technical consultation and research, developing documents for communicating to the programming team how to implement a carbon footprint calculator. Mr. Gore was an active participant of both the early design discussions as well as later review meetings. The specifications were used to develop an early version for the initial Sundance release under guidance from Sunnywood. The current calculator was able to be developed entirely from the specifications without further consultation from Sunnywood. Check out the film (now on DVD), and don't forget to offset your carbon footprint!